our stays keep your collar in place ensuring a polished finish to the most distinguishable feature in any dress shirt. You can tell a lot about a man by the look of his collar. 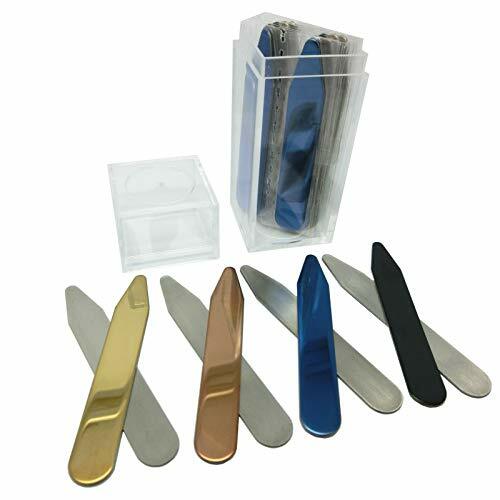 Why choose Shang Zun Collar Stays? The mission of Shang Zun is to provide the high quality, stylish and healthy collar stays for men's dress shirt. Each item undergoes numerous checks during the manufacturing process with a final check performed before it leaves our factory. Also, have any question please don't hesitate contact us, we will do our best to serve you! Blue: 2pcs-2.2",2pcs-2.5". Black: 2pcs-2.2",2pcs-2.5". Golden: 2pcs-2.2",2pcs-2.5". Rose Golden: 2pcs-2.2",2pcs-2.5". Convenient and easy to travel with packaging. 2.2 and 2.5 inches is the popular size for the almost dress shirt. They are the small detail that makes your dress shirt look crisp at all times. If you have any questions about this product by Shang Zun, contact us by completing and submitting the form below. If you are looking for a specif part number, please include it with your message.